While the menus of some eateries seem to have been designed by committees and focus groups, the Temper group of restaurants has never like that. Each restaurant’s focus on smoked or grilled meats and a fresh spin on familiar ways of serving them – whether it’s tacos or curry – has always felt like a deeply personal reflection of Temper’s proprietor Neil Rankin and his tastes. His purposefully idiosyncratic takes on tacos and curry aren’t to everyone’s taste, but I have – for the most part – loved his work at the first two Temper restaurants. The third Temper, based in Covent Garden, feels no less personal, but may be stretching Rankin’s formula farther than it can handle. This Temper focusses on pizzas, but not the classic, strictly proscribed Neapolitan style that has taken London by storm in recent years. Oh no, that wouldn’t suit Rankin’s iconoclastic style at all. He has instead opted to serve rectangular Detroit-style pizzas, a thick deep-pan pie with toppings that go all the way to the edge. Alongside these oddities are vegan Roman-style pizzas which is a striking departure for the notoriously carnivorous Rankin. Even the décor is something of a departure from the clubby style of the first two Tempers. 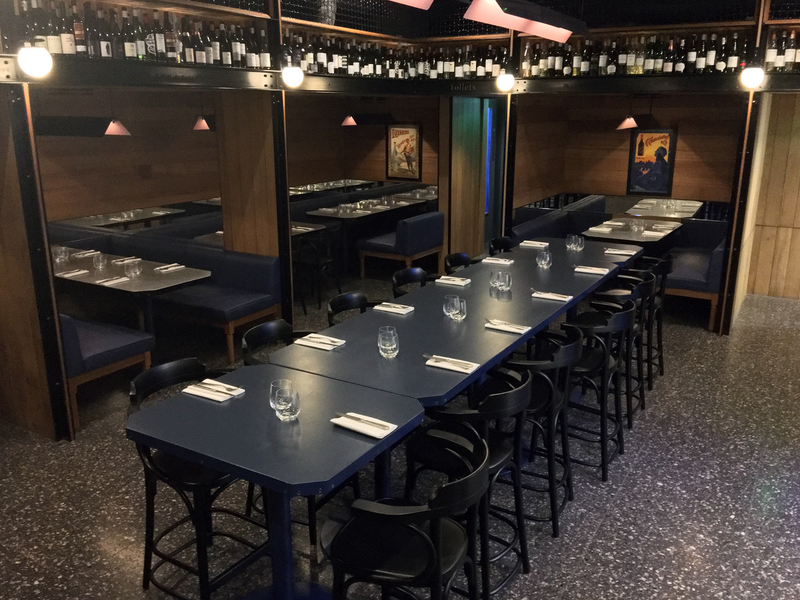 The big windows of the ground-floor premises and al fresco seating give the place a brighter, airier feel (although the frequently empty basement dining room retains a more ‘traditional’ Temper feel). My only complaint here is that the backless stools at the counter aren’t as comfortable as their more sensibly designed counterparts at the Soho and City branches of Temper. You’re generally better off snagging a perch at the counter or an outside table if you can. 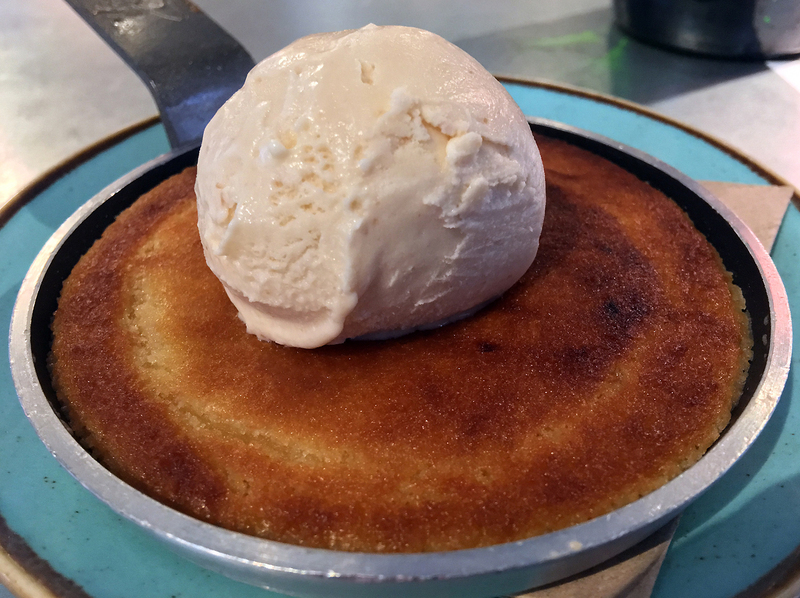 While I haven’t attempted to eat the whole menu as with some of the other reviews on this site – it’s far too vast, even for my gaping gob – I did sample a reasonably broad cross-section to get a feel for this third Temper. It was still one heck of a gut-busting ride. Temper’s Detroit-style pizzas are a peculiar beast, looking more like Pizza Hut than Pizza Pilgrims due to their thickness and eclectic selection of toppings, all of which would make many Neapolitan purists froth at the mouth before succumbing to a debilitating aneurysm. The cheeseburger pizza was, frankly, vile. The globules of beef and cheese were lost, smothered underneath a burger sauce sweeter than a sackful of puppies dunked in sugar, while the dense base resembled cheap white supermarket bread. Surprisingly, I found the most joy in the heavily caramelised edges – their crunchy chewiness was unexpectedly winsome and better than the rest of this pizza put together. 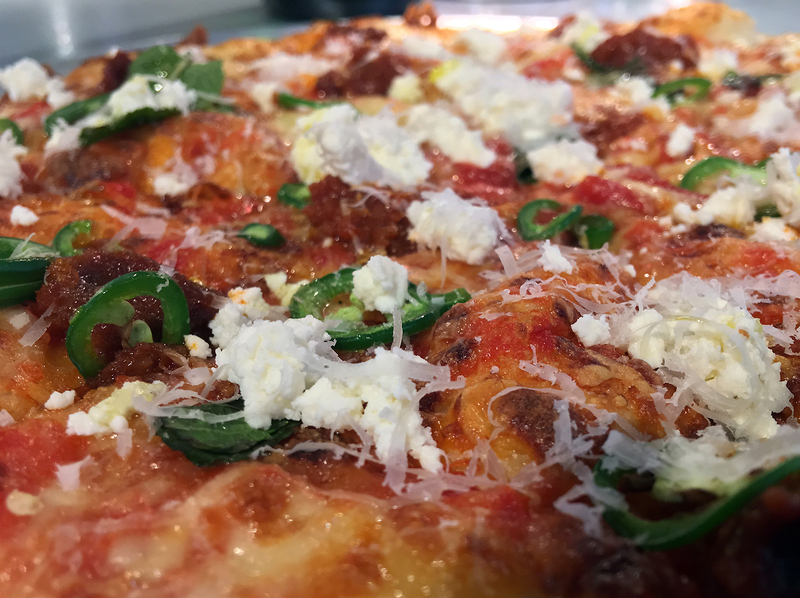 Almost as if the kitchen had sensed my complaints, a sausage and peppers Detroit pizza on a subsequent visit was significantly lighter and less bready than before – it was almost ciabatta-like. Unfortunately, this meant the edges were also less crispy and chewy. Although the cheese was still shrug-inducing, the herby, hearty meatball-shaped sausage chunks were aptly complimented by the sweet, gently piquant slices of pepper. Although the apologetic edges were a disappointment, this pizza was still a step-up from the cheeseburger abomination. Temper’s Roman-style pizzas are a very different kettle of fish. 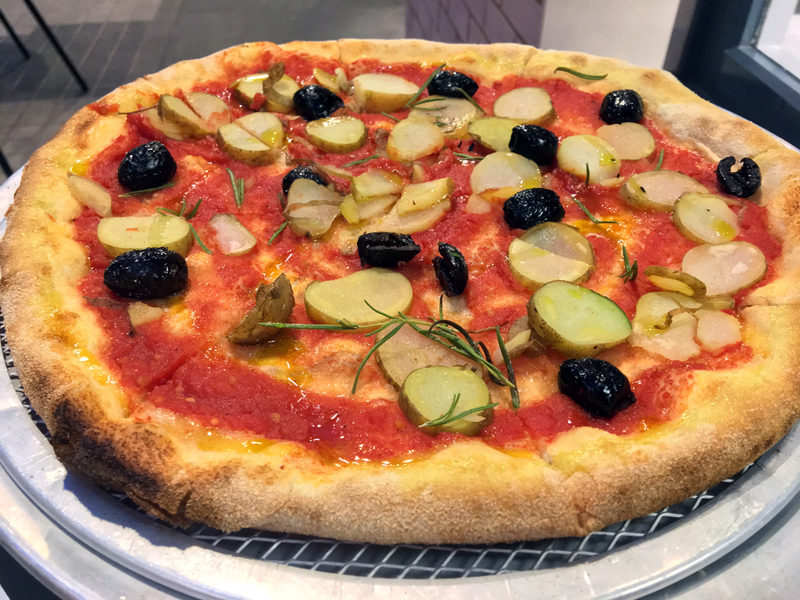 Although not quite a match for the pizza bases at Rome’s Pizzarium, the thin, crisp and airy bases here were clearly of a similar style despite the different shape. 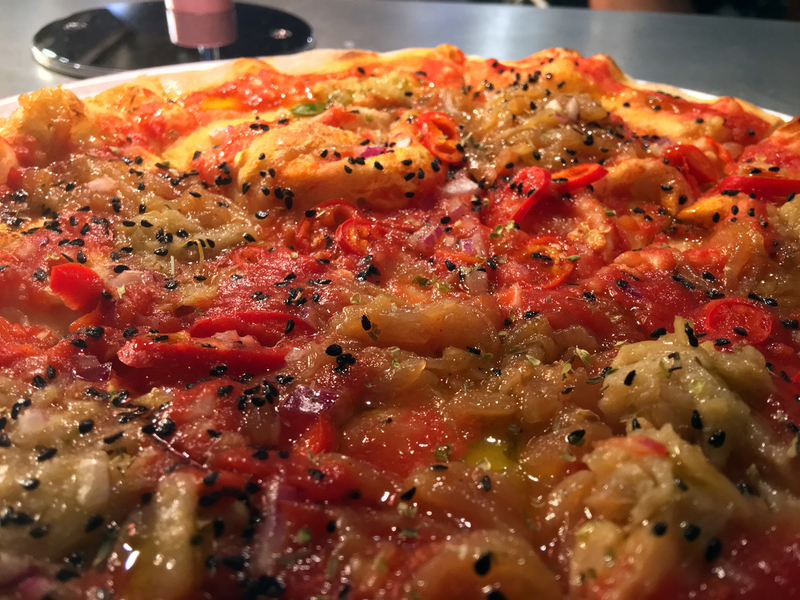 The vegan toppings, unprecedented for a Temper, were very much a mixed bag in my experience. An odd mix of potato, olives and dill proved to be surprisingly dull. Although olives and dill were reasonably flavoursome, the tomato sauce was not and the potato slices added some unwelcome stodginess to the proceedings. This limp, lifeless affair was such tedious eating, I had to order the punchy anchovy and parsley dipping sauce to pep things up. You say potato, I say no thanks. If there is a Creator, then the humble yet divine anchovy is surely a sign of her handiwork. Onion, fennel and chilli pizza was somewhat more successful. Despite their sauerkraut-like appearance, the onions had a mild sweetness while the usually strident taste of fennel was surprisingly muted. The occasional burst of heat from the slices of chilli and the moderately umami tomato base were the dominant elements here. It wasn’t bad overall, just a little one-dimensional. The ‘Massachusetts round’ pizzas were cut from a similar cloth as their Detroit cousins, just a lot thinner and crisper as a result. Although just as much a headline feature of the menu as the Detroit-style pizzas above, they have now been dropped and replaced with an expanded slate of Roman-style pizzas instead (both vegan and non-vegan alike). This is a real shame as I grew unexpectedly fond of the Massachusetts round range as they had the best parts of the Detroit-style – the crispy, chewy edges – but in a generally lighter, easier to digest package. Many, but not all, of the topping combinations are now available on the Roman-style bases though. The nduja Massachusetts round had a gentle chewiness that worked well. The lightly elastic base cheese was aptly complimented by milky ricotta, a lightly umami and sweet tomato paste with intermittently meaty piquant hits provided by the nduja. Occasional sprigs of refreshing mint and those chewy, crispy edges rounded out a surprisingly delightful pizza. The base from the nduja Massachussets round made a repeat appearance in the ‘New England clam bake’. 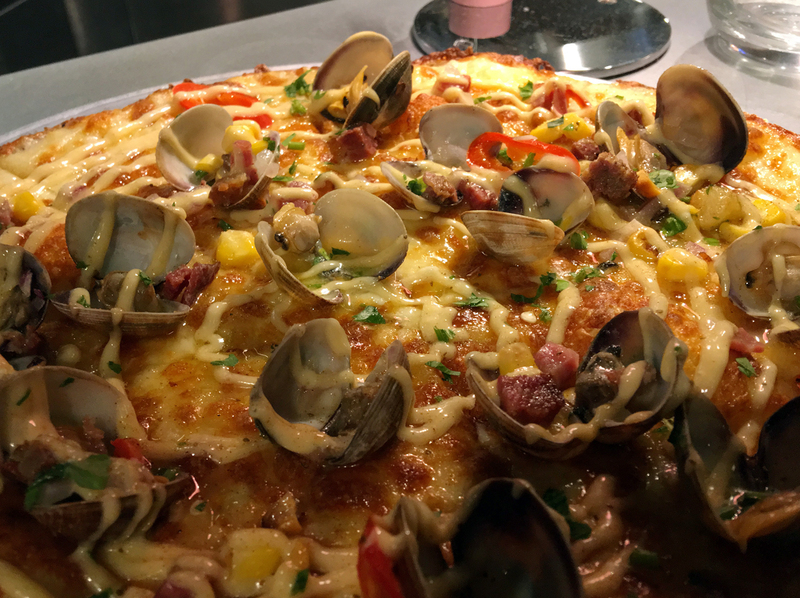 Topping a pizza with clams, sweet corn and pancetta-like pork bits sounds like utter madness, but it all came together in an unexpectedly harmonious fashion. The briney and chewy clams, viscously creamy cheese and the porky pancetta hits were a soul-soothingly satisfying combination on that chewy base. 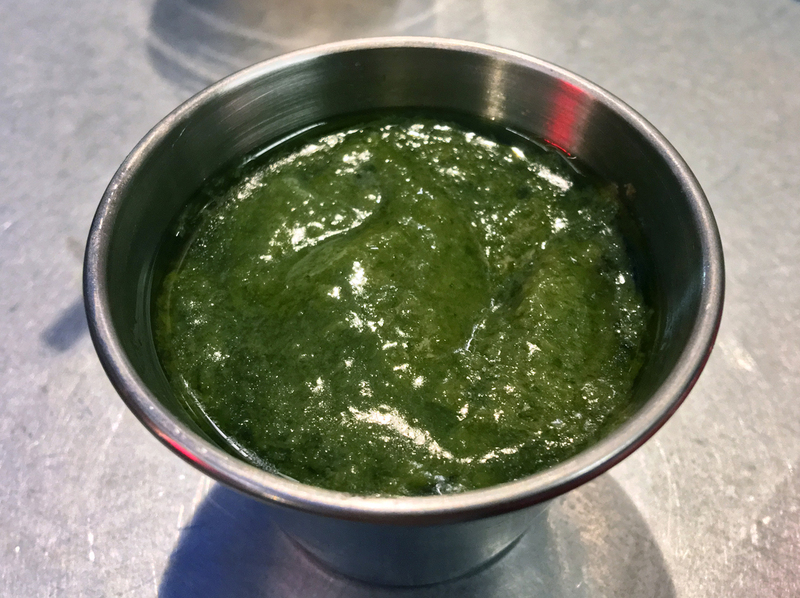 A thimble of clam-derived stock made for a fine crust-dipping sauce. Even the sweetcorn, the salad dodger’s vegetable of choice, had its place – enough of it was present to add a bit of sweetness, but not too much so as not to outstay its welcome. Sadly, this ‘New England clam bake’ has disappeared from the menu along with the Massachusetts round base and that’s a real loss. I’ve always been sceptical of using distinctive meats in ragus where they’re prone to losing their character from all the mincing, grinding and saucing. The goat and salumi ragu was far from bad with a mild earthiness and a sweet sharpness, but I would hardly have known it was made from goat and salumi if the menu hadn’t said so. I was fond of the crunchy morsels of deep-fried polenta though, even if they were more like hash browns than traditional polenta. ‘Toga’ is an anagram of ‘goat’. Coincidence? Yes. You can have bread with the ragu instead of polenta, but where’s the fun in that. 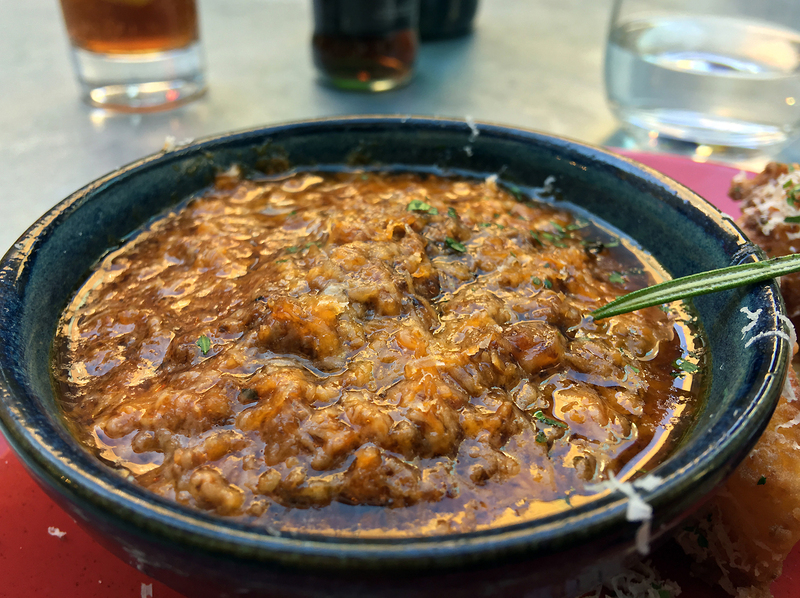 The bone marrow ragu was, unsurprisingly, a far more sensual dish with a slick rich umami infusing the meat-based and -laced sauce. 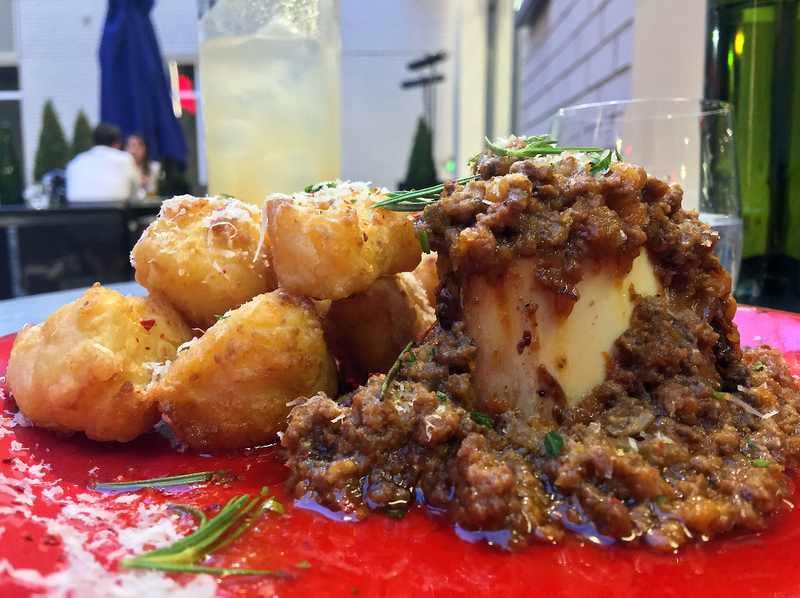 Even the deep-fried polenta bites were better with a more pronounced nuttiness that went beautifully with the rich meatiness of the ragu. Ask for a spoon so you can scoop out every last drop of bone marrow. The vegan ‘ragu’ of aubergine and peppers was unsurprisingly reminiscent of a ratatouille, a ciambotta or even an imam biyaldi. It was a light, inoffensively but also unmemorably sweet mixture. 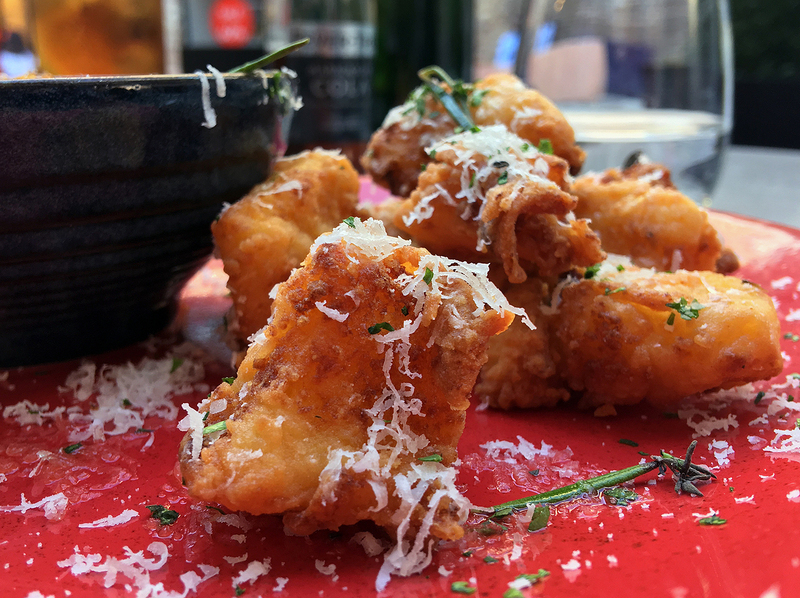 The unexpectedly soft, floppy and bland deep-fried polenta bites were a real regression from their previous appearances. 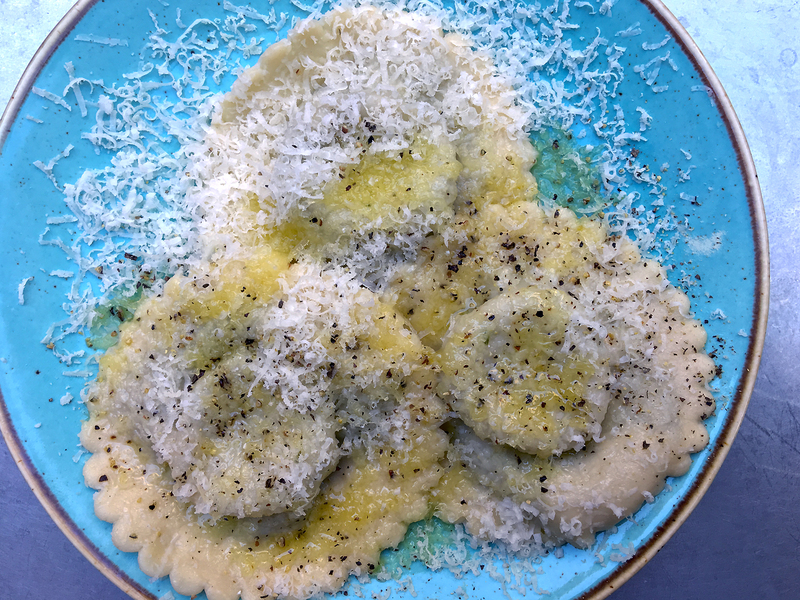 Ravioli laced with beef fat had a firm bite with a pesto-like filling at the centre. It can’t match the wares of the now sadly-departed Latium, but it was still enjoyable stuff nonetheless. Razor clams were a tad overcooked, with their springy firmness metamorphosing into an overly chewy rubberiness. 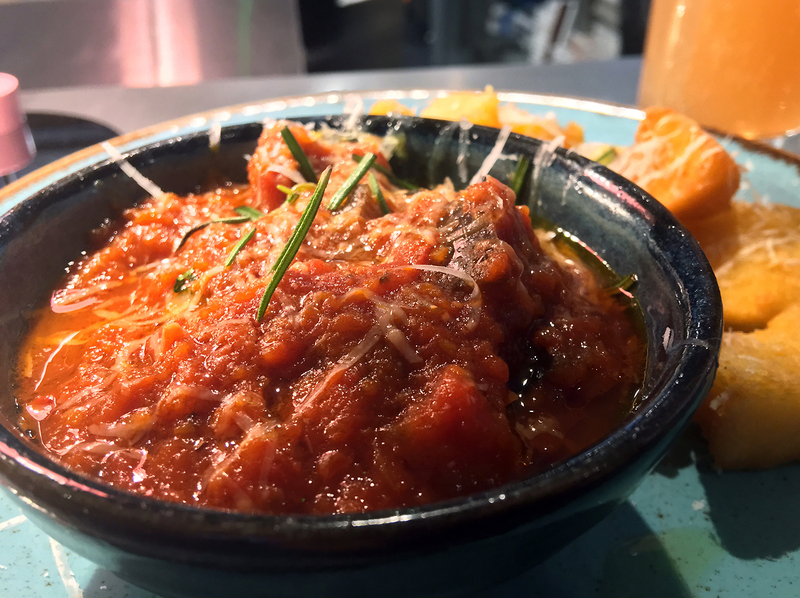 There was still plenty of joy to be found in the tingly and lip-smackingly moreish nduja sauce though. I like my bivalves the way I like my lovers – firm and spicy with a spring in their step. As the name suggests, lardo carbonara saw strips of fatty lardo take the place of traditional pasta. Even with the overly hard and chewy guacinale letting the side down, this was a sumptuously decadent dish with the unctous ‘pasta’ aptly complimented by hints of fennel and umami parmesan. Thankfully for my cardiac well-being, this delight was only available in a small portion. 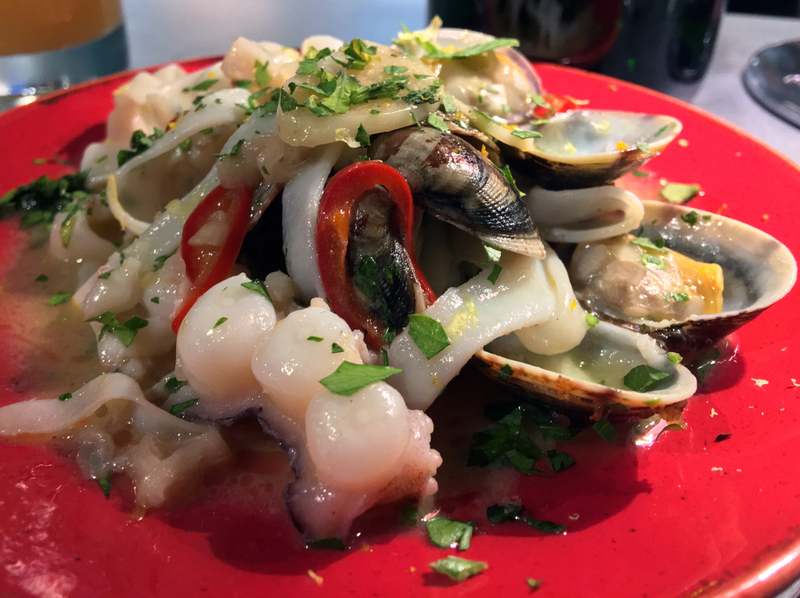 In a similar vein to the carbonara, the ‘linguine’ in the cuttlefish vongole were actually firm, springy strips of cuttlefish. 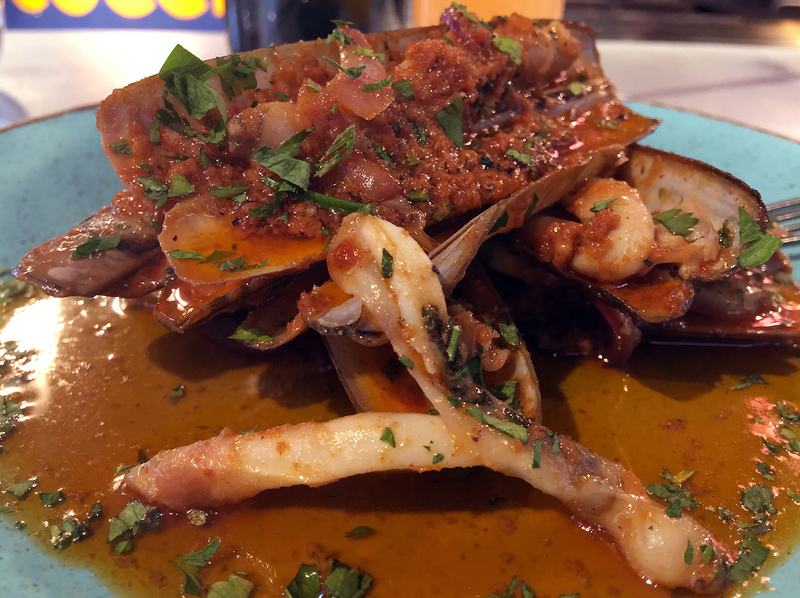 Accompanied by extant bits of cuttlefish tentacle and carapace as well as pleasingly briney and chewy clams, everything was bound together by a lip smackingly garlicky sauce. This review’s procrastination was brought to you, in part, by Vongole Fisarmonica. 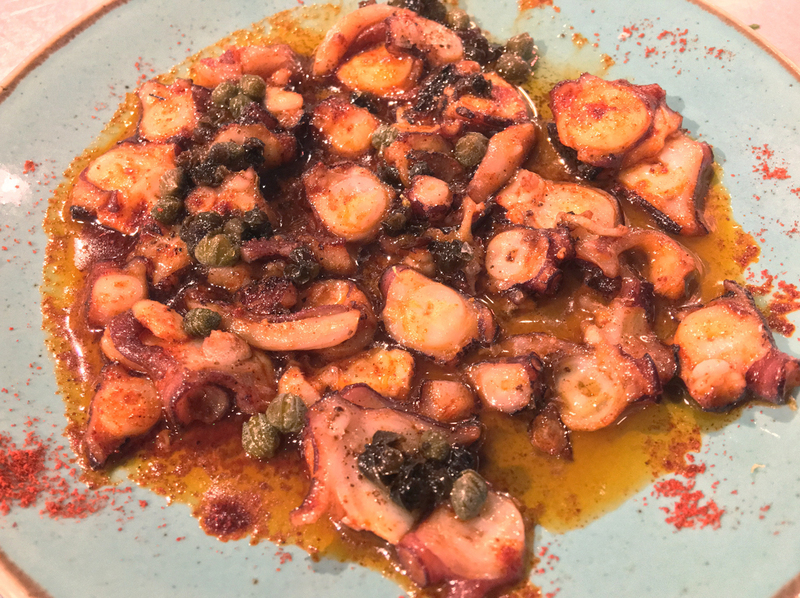 Although the octopus tentacle came sliced, the thickly cut segments ensured it didn’t lose its meaty firm mouthfeel – unlike the ham-fisted effort at Bob’s Lobster. The chopped tentacle was an apt conveyor for the unexpectedly buttery, unctous and tingly sauce. A true delight from start to finish. I had to dial down the iridescent crimson colour as it looked unrealistically colourful! 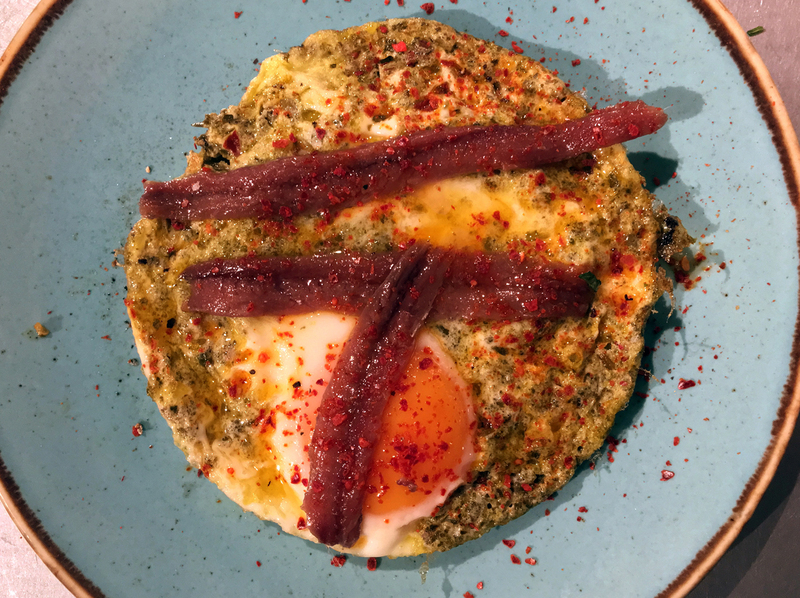 Harissa egg was a soothing, comforting combination of richly runny yolk, the punchy saltiness of anchovies and a sprightly piquant sauce. The harissa egg looks a bit like an exotic pescatarian fry-up in this photo. 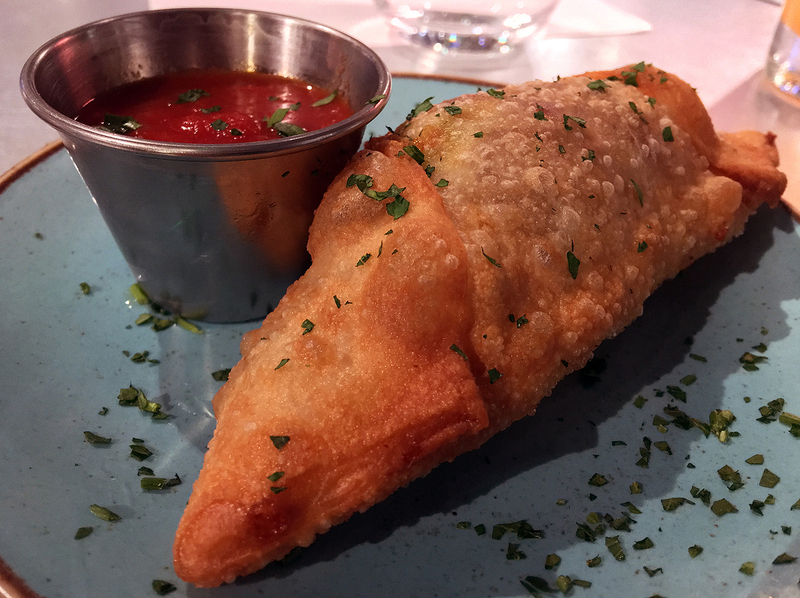 Stromboli resembled a savoury deep-fried croissant – which is definitely a good thing in my book. The crunchy yet light pastry, free from excess oil, contained surprisingly scanty amounts of provolone and guacinale. Although disappointing, there was still joy to be had in dunking pastry pieces into the lightly tingly ketchup-ish sauce. 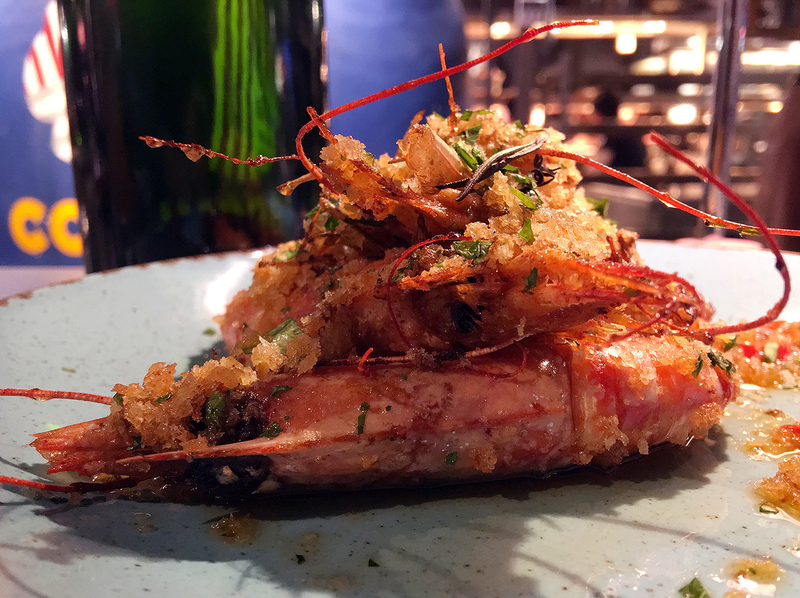 I’m uncertain if the ‘red prawn crumble’ is supposed to use carabinero prawns, as it certainly didn’t taste like it. This aside, the prawns were pleasingly plump and firm, although there wasn’t as much slurpable head gunk as I would’ve liked. The crunchy, fine-grained bread crumbs provided some unexpectedly winsome textural contrast. I’d take this over most fritto misto any day of the week. 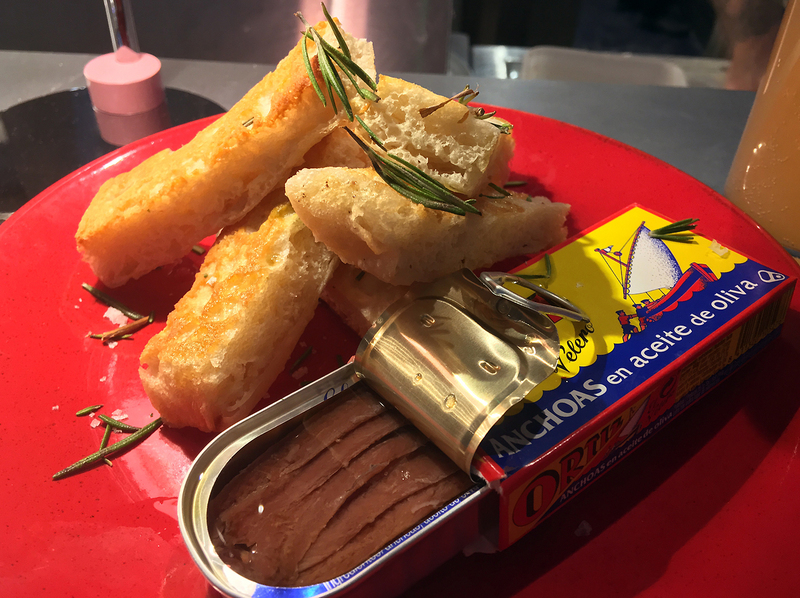 The box-and-tin-can presentation of the anchovies was a bit twee, but it didn’t detract from the salty umami punch of the little fishies. While not as potent as many of the Cantabrian anchovies I’ve had in the past, there were still delightful enough for me to overlook the oddly leaden bread soldiers. 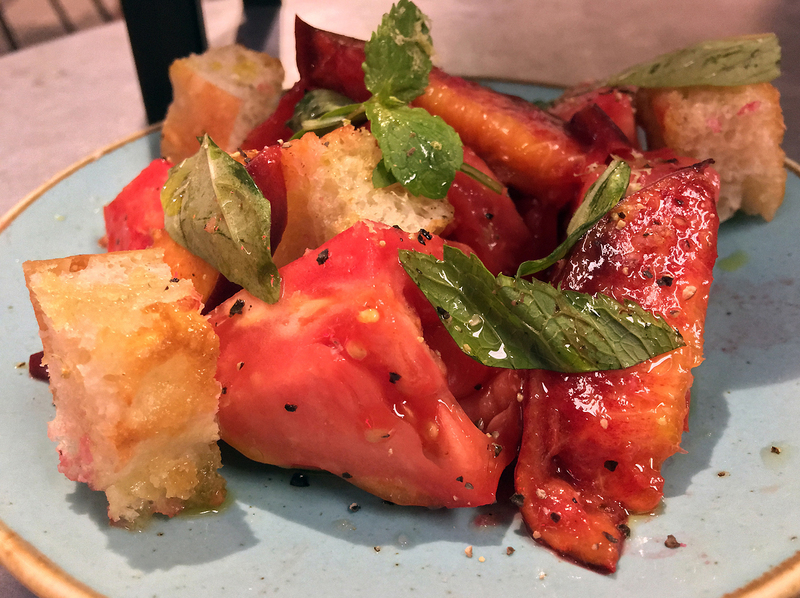 Panzanella was a beautiful thing, with richly umami tomatoes and crunchy fried bread meshing wonderfully with plump, juicy and delicately sweet stone fruit. 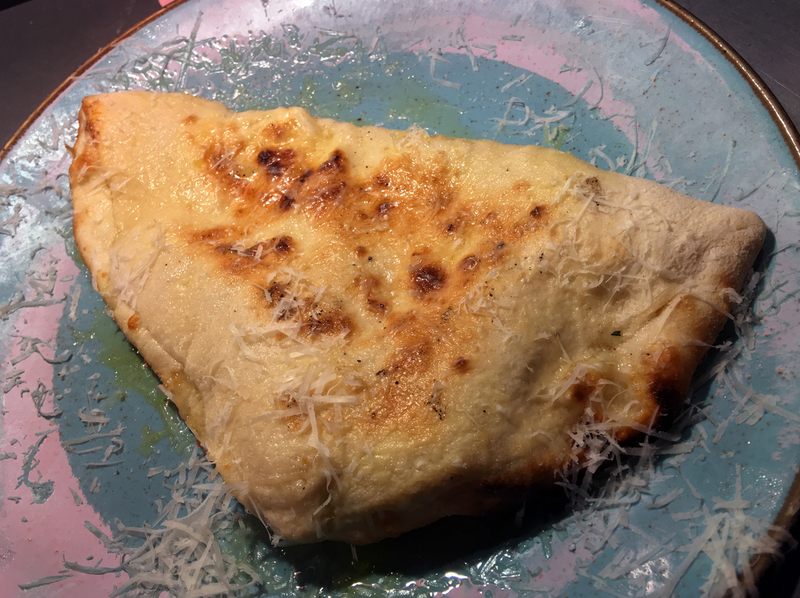 Garlic calzone is effectively Temper’s answer to the garlic bread you see in most high street pizza restaurants. This light, fluffy, elastic pouch full of garlic buttery goodness was so delicious and so fitting, that it’s frankly outrageous that the nation has put up with the tawdry garlic bread usurper for as long as it has. I’m surprised Straight Up London hasn’t attempted another hatchet job yet. Temper’s ice creams and sorbets were a mixed bag. Almost all of them were smooth and free from crunchy ice crystals, which is something. The pistachio was a weirdly unpleasant creation with an off-putting chalkiness to it. 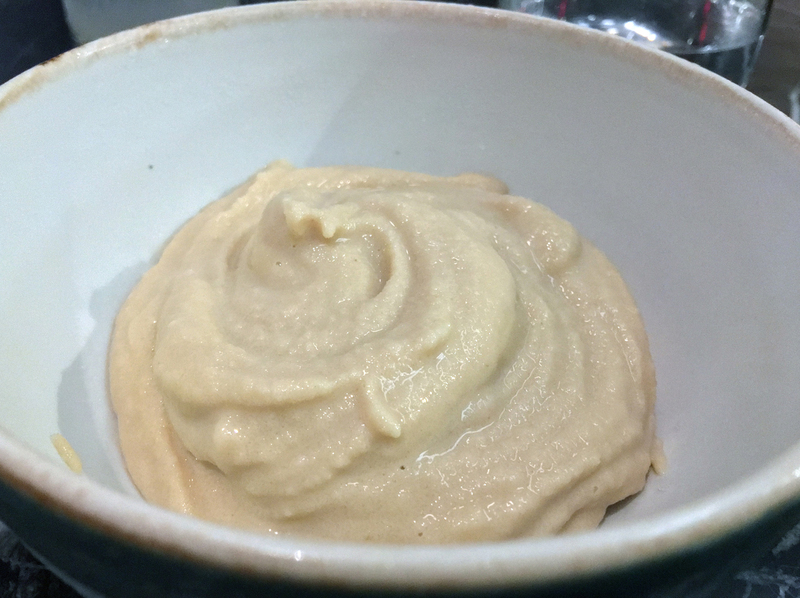 Peanut butter was more like halva and thus far from unpleasant – it merely failed to capture the viscous gooeyness which makes peanut butter so joyful. 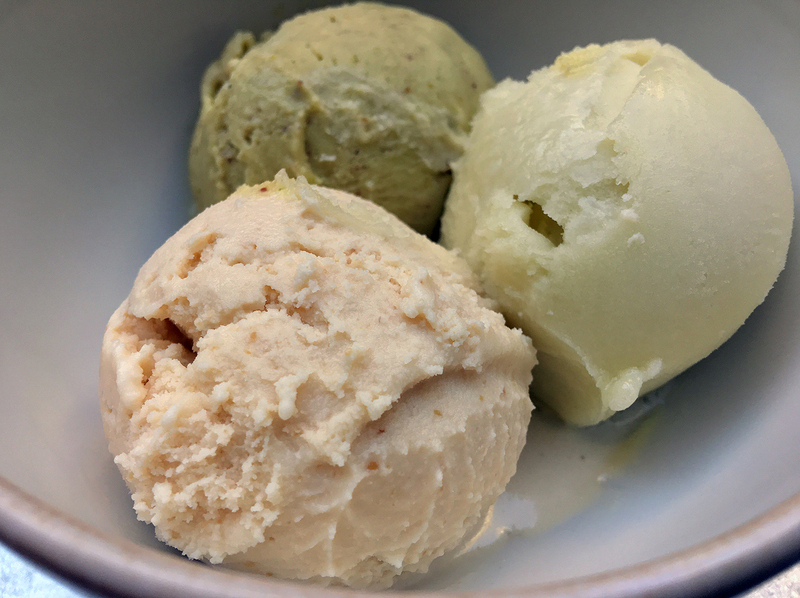 Apple sorbet was an unqualified success – true to the fruit with its sweetness and crisp, sharp refreshment. The various Tempers have always had a wobbly relationship with ice cream. I wasn’t a fan of the shallow-dish cookie dessert at the original Soho Temper, which makes my infatuation with the Nutella cookie dessert here all the more surprising. Although it didn’t taste much like Nutella, the fluffy, moreish cookie was surprisingly cake-like and not excessively sweet like its Soho counterpart. The peanut ‘butter’ ice cream was much the same as it was before. Even so, I found myself won over by this odd couple. Cooked in the same huge wood-fired oven as the round pizzas. Cannoli wasn’t a patch on the elegantly accomplished version at Lina Stores. 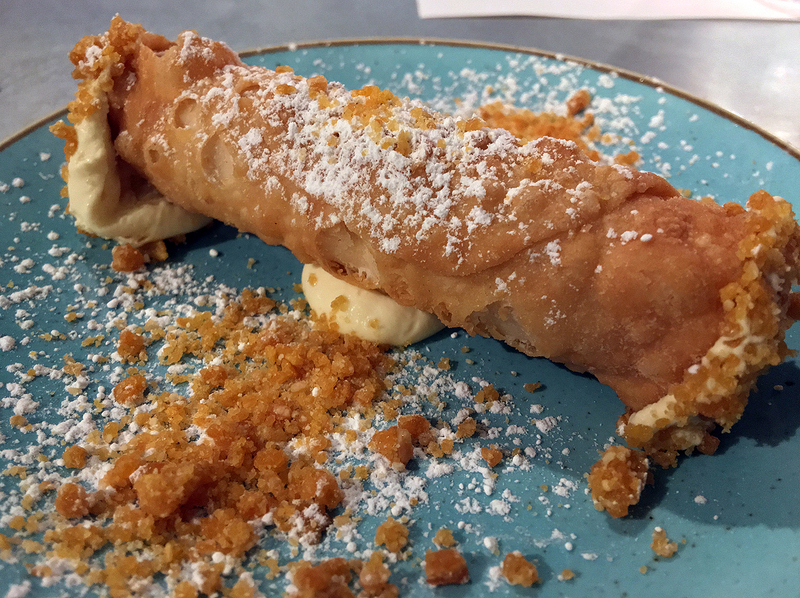 The hard, stodgy pastry was also a tad oily, while the crunchy nut cornflake filling and dusting fell into the uncanny valley of flavours – it comes close, but not close enough with its wonky resemblance proving to be unsettling and unsatisfying. 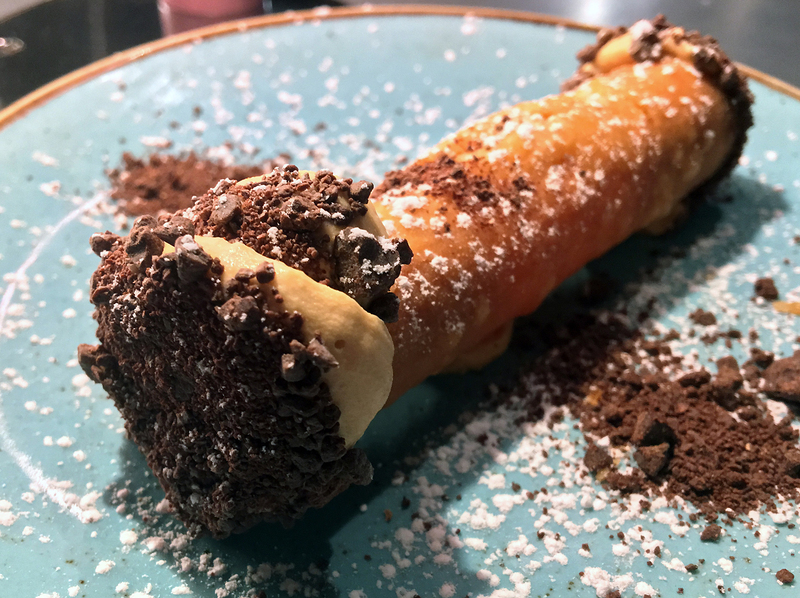 The dulche de leche cannoli was no better, with the pastry still fit only for insulating walls and the tame filling a dulche de leche in name only. Nowhere as addictive as a bowl of crunchy nut cornflakes. A word of warning for non-drinkers: Temper’s affogato uses a selection of alcohol instead of coffee. I normally can’t drink, but a very careful teardrop application of the Cocchi di Torino to the fior de latte soft serve ice cream was enough to discern that it wasn’t for me. Although the tipple did add a touch of smokiness to the proceedings, there was also a harsh boozy astringency which didn’t suit this teetotaler one bit. 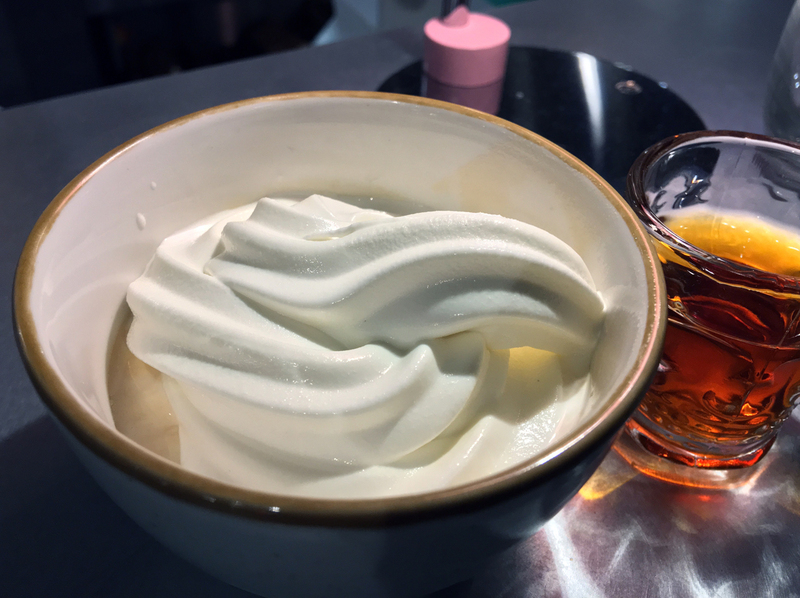 The ‘fior di latte’ soft serve was, unsurprisingly, something of a misnomer – it didn’t strike me as any milkier, denser, creamier or smoother than the other frozen treats at Temper. It was just plain. The staff will apparently whip up an off-the-menu, more traditional coffee-based affogato should you so desire. The soft-serves are also available on their own, booze-free, but something had clearly gone wrong with the caramel-flavoured version. Not only was the taste of caramel faded and weak, it was oddly gloopy with crunchy ice crystals clearly present. I almost sent this dish back and that’s something I rarely ever do. It’s not hummus, but a horribly misshapen soft-serve ice cream. Other reviewers have not been kind to this latest Temper and it’s easy to see why. 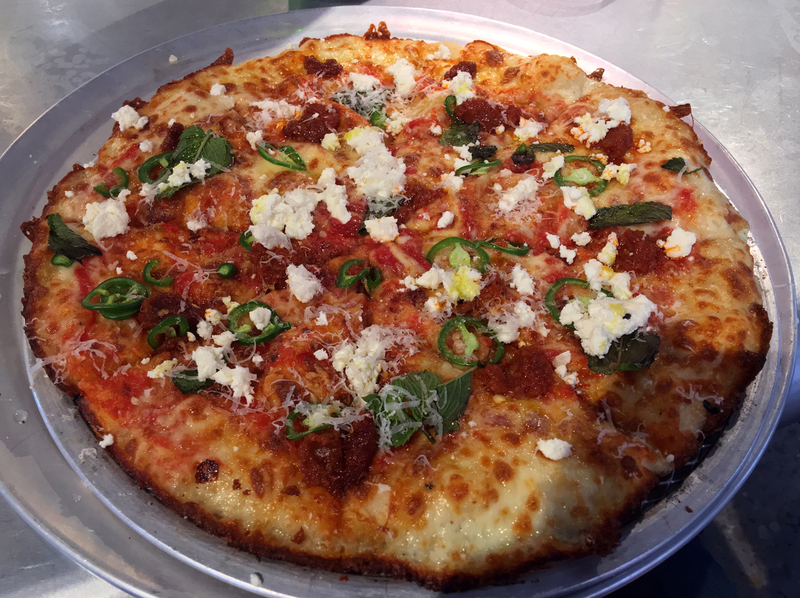 While Neapolitan-style pizzas are a food for all-seasons and for almost any occasion, Temper’s heavy Detroit-style pies are for feasting with others in the depths of winter, either before or after several long conversation-soaked hours in the pub, when you need as much ballast on you as possible. 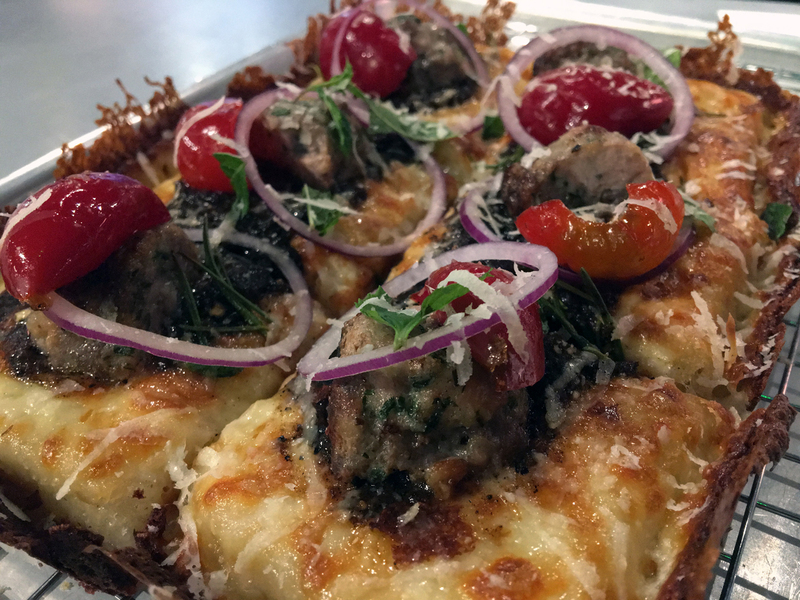 Other than that, there are few other occasions where I’d favour a Temper Detroit-style pizza over a Neapolitan-style pizza (and the less said about that diabolical cheeseburger pie, the better). It’s therefore no surprise to see the Covent Garden menu evolve rapidly, with the Massachussetts round pizzas dumped in favour of an expanded presence for the Roman-style pizzas as a more populist alternative to the Detroit range. On one evening, when I had a clear view of both passes, the Roman-style pizzas were clearly more popular than the Detroits. While I wish the Massachusetts range had survived as they were, in my eyes, a happy compromise between the Detroit and Roman styles, there’s still a lot of joy to be had at Temper away from the contentious range of pizzas. The smaller starters/side dishes were, with a few exceptions, delightful in their inventive verve and accomplished execution. Only the exceedingly wobbly deep-fried polenta bites give significant cause for concern. The Temper restaurants may well be a deeply personal and quirky expression of Rankin’s preferences and outlook, but he’s also a hard-nosed businessman willing to dump the curry menu at Temper City in favour of a Soho-style menu in the face of commercial realities. Such pressures seem to have prompted the nixing of the Massachusetts round pizzas and it’ll thus be interesting to see how Temper Covent Garden fares in the months ahead. Temper Covent Garden isn’t a knockout success likes its predecessors, but it’s still worth your time. But you really, really have to be in the mood for it. 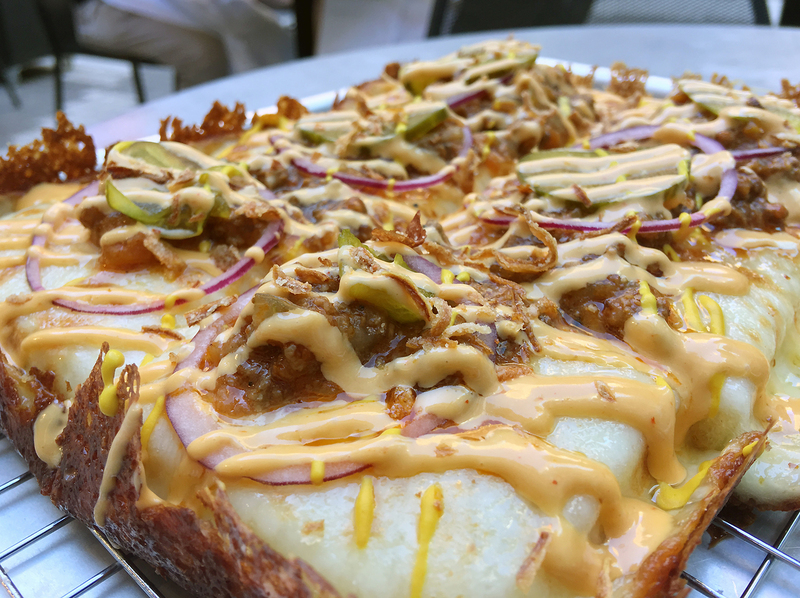 What to skip: …except the cheeseburger Detroit-style pizza. And most of the vegan Roman-style pizzas. Opening Hours: Monday-Thursday noon-23.30. Friday-Saturday noon-midnight. Sunday noon-22.30. Total cost for one person including soft drinks: £40 approx. 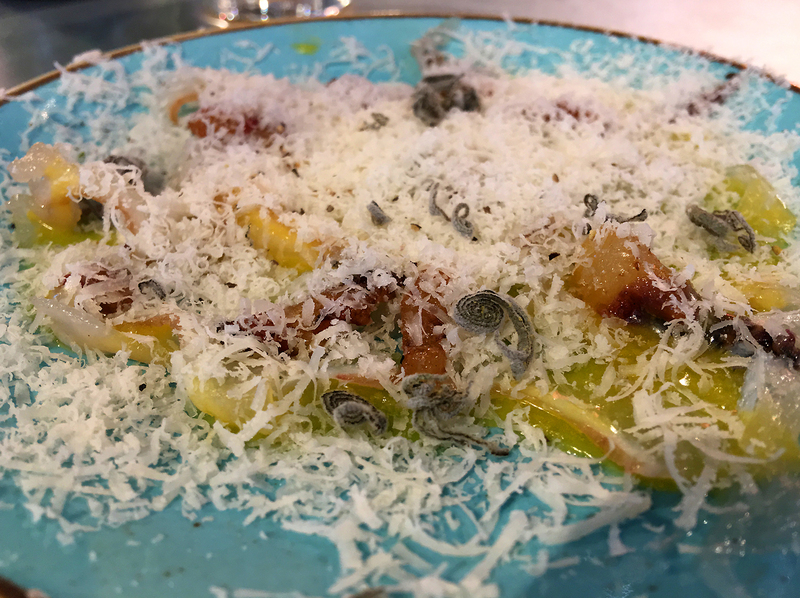 Tags: affogato, anchovies, bone marrow, calzone, cannoli, carbonara, cheeseburger, clams, cookie, covent garden, cuttlefish, egg, ice cream, lardo, london, nduja, octopus, panzanella, pizza, polenta, prawns, ravioli, razor clams, restaurant, review, ricotta, sorbet, stromboli, temper, vegan. Bookmark the permalink. I saw this being kitted out prior to opening and it looked so nice inside I vowed to try it. After reading about the cheeseburger pizza though, maybes not.